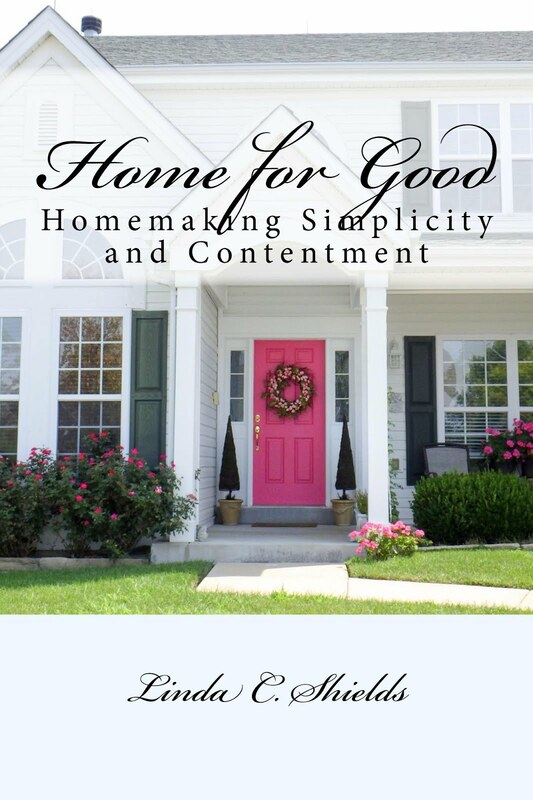 Home For Good: Great Ideas: De-Clutter! ﻿ I know, we hear that all of the time, "De-Clutter!" Who doesn't know we need to do it? Again and again, over and over we get down on ourselves because we need to do it. We try. We forget, after a while. We fail. Why is that? What's so hard about getting rid of the clutter, once and for all? I believe the thing that makes it hardest is that we think we must do it all, all over the house, all at one time. Nothing could be further from the truth. Decluttering needs to be an ongoing process, just like sweeping the floor or doing the dishes. We can handle it if we don't make it a gigantic task in our minds by thinking of it as one big job. Why not just decide to get rid of a minimum of one unnecessary, unneeded item per day? How hard would that be? Not hard at all, really! Why not just keep a bag or a box in the garage, or some out of the way location, where you can toss that one item per day until you take it to the donation or recycling center? You don't have to wait until you have a carload. Just drop it off, like we do, whenever you go past your favorite local charity. I keep a tablet and pen next to my donation box where I jot down what I have thrown in there so I can keep track of it for tax purposes. Before hauling away my donations I also snap a photo with my phone, which I save, also for tax purposes. I always ask for a receipt when I drop it off, and I staple that receipt to my donation list and then drop it into a file folder marked "Donations". It is all ready for taxes to be done at the end of the year. By the way, we have stopped donating to GW, since they are a business--not a charity. They pay their workers minimum wage, I have read, and their prices have risen so much it's hard to find a bargain there anymore that would help out anyone in need. Yet they make huge profits for their owners from items donated. Instead, we now give only to real charities, like AmVets or a church sponsored charity nearby. It isn't hard, when you are putting clean dishes away, to pick out one dish or glass that never gets used and place it in your charity box. Or one blouse, pair of slacks, or sweater from your overstuffed closet or chest of drawers. Or just throw out a few bottles of old make-up or shampoo that you know you will never use. 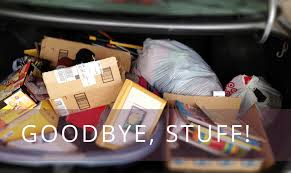 Think of de-cluttering as a normal daily activity rather than an impossibly huge task. Removing even only one item a day will amount to 30 items a month, or 365 items at the end of the year. That, in itself, will not only make a real difference--it will make you think twice before buying something that will eventually become just another piece of clutter. This is the last snapshot I took of donations I was taking to AmVets. feeling so much lighter--it really is the best way to lose weight! LOVE this daily dose of charity! And the writing it down as you go is brilliant....but, of course, you would. Sometimes my whole diningroom looks like a donation box! When Ebay gets out of hand. You are right about Goodwill. I can't remember how much their CEO makes, but it's in the millions. I feel bad when I donate their, but they are close. You just reminded me that I used to donate to Amvets, but since we got rid of our home phone a couple of years ago, I don't hear from them anymore. I have to get in touch with them. Just saw a van down my street the other day. Thanks for the reminder! We have an Amvets thrift shop nearby called Red Racks. Maybe you have one of those where you can drop things off? Great post. I love the idea of taking a picture of the donation for taxes.